For those who are looking for subscriptions other than the usual, there's Saladbox. They sent in one of their VMV boxes for me to do an unboxing on. So let's see! VMV is a brand that will somehow hold an invisible but big, big place in our family. You see, waaaaaaay before I was even born, Dr. Vermen Verallo saved our family. In 1985, after mama and papa came back from their honeymoon, weird things started happening to papa's skin. He'd form these blisters, and then the blisters would increase in number, and then they'd merge, and then they'd violently erupt. And when they did erupt, they left large craters of wounds on the skin. At the time, waaaay back in that time, no one could understand what was happening. They later knew it was Bullous Pemphigoid, an autoimmune disease involving blisters that form between the epidermis and the dermis. I was not born yet, but people would tell me that my dad was like a mummy coz he had to be in bandages from head to toe day in and day out because of that. Relatives avoided him because at the time no one knew what Bullous Pemphigoid was and they were scared it was contagious. Such is our family's gratitude to Dr. Verallo because she was among the leading dermatologists at the time who fearlessly did everything she can to control my dad's condition. Now, there is a very straightforward manner of treating Bullous Pemphigoid, but at the time, there was none. She experimented tirelessly with everything she could do to get it to stop. At the time my dad and 2 other people got it, but only my dad came out of the hospital alive. Such is our gratitude to Dr. Verallo. Okaaaay I got carried away agaaaain as usual. 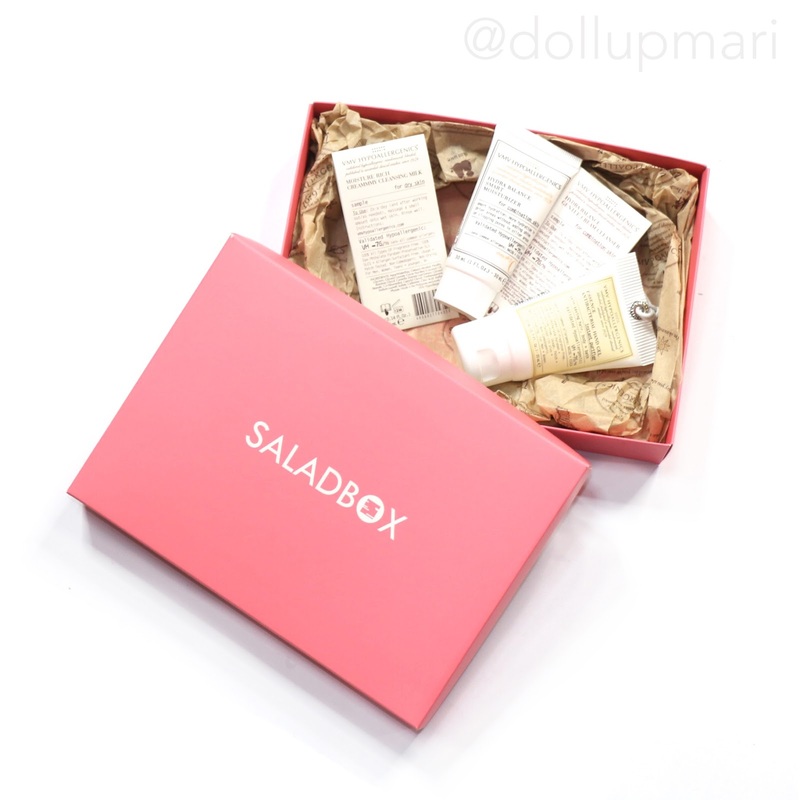 So this is VMV's collaboration box with Saladbox. 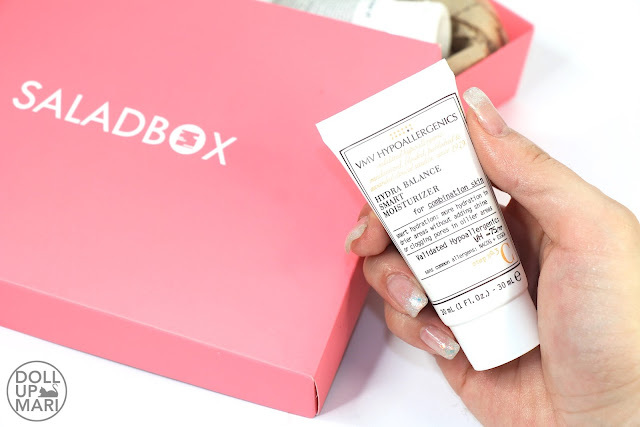 If you're looking to subscribe to a box that features more high end brands, Saladbox is there for that. They work with brands such as Benefit and Victoria's Secret, so you're more or less sure that each box every month is a chance to try high end brands at a controlled price. So to start off, they sent in this Moisture Creamy Cleansing Milk. I honestly have not used this yet because given the suuuper small size, I thought this'll be best for travel for me. This is good for just one wash, so yeah, it's targeted for travel. 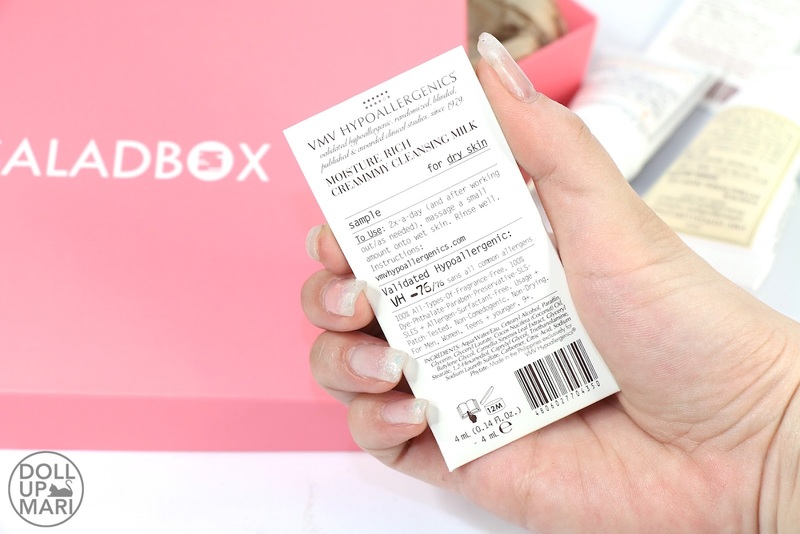 This box also included their Hydra Balance Gentle Cream Cleanser. And again I am saving this for travel! 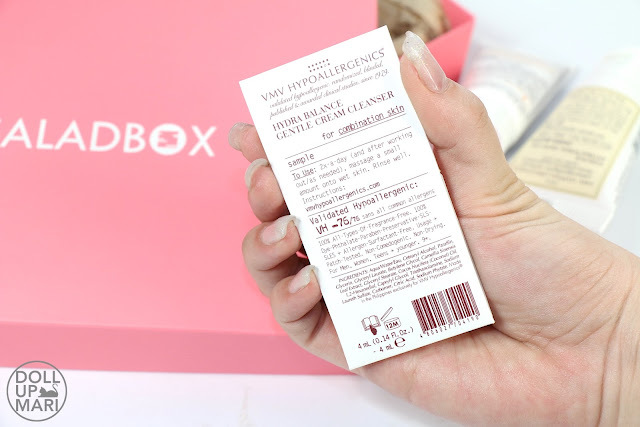 For those who are obsessed with hygiene but have sensitive skin, VMV came up with an Antibacterial Hand Gel that comes in a convenient tube that can be attached onto your bags. This has no fragrances, parabens, dyes, phthalates, and preservatives. But for those who are allergic to the default aroma of alcohol, this still smells like rubbing alcohol. When it said fragrance free, they just meant they didn't add any unnecessary fragrance. But they were not able to get rid of the default aroma of rubbing alcohol, and I don't think anyone ever can because alcohol's aroma is one of its key characteristics. This, thankfully, is not so sticky, so for when you're in a pinch, this is a good choice. The design of the packaging is also cute and minimalist, so if you're shying away from all the childish bottle designs that most hand sanitizers have today, then this is a good choice for you. They also sent in a sample of their Hydra Balance Smart Moisturizer for combination skin. This is Validated Hypoallergenic, as are all of their other products. And as usual, this has no fragrance so it has a very mild scent. It has a very very faint scent of the ingredients, as what a cream would smell like, if that makes sense. This is very lightweight, fluffy, but very protective. 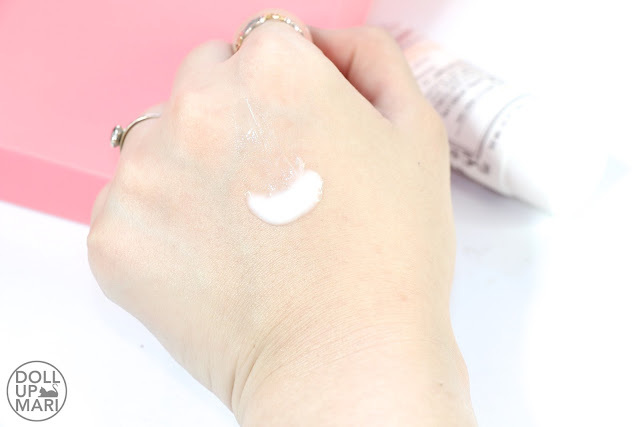 You can immediately feel that it forms a barrier on your skin once you apply it. And then that barrier stays there to keep it moist and hydrated. 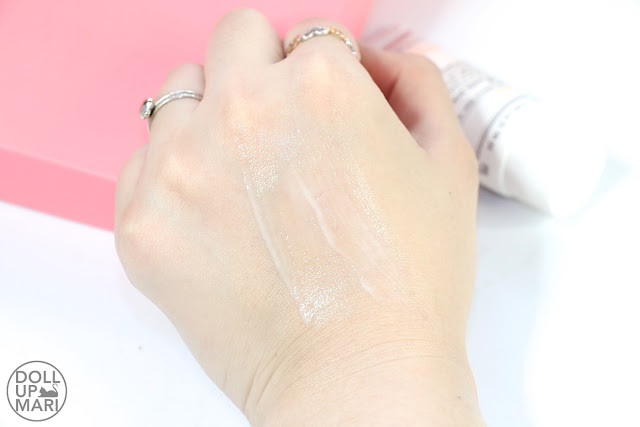 This is a very good product for those who sweat a lot because at least even if you do sweat a lot, this has a great way of not getting washed off because of its texture. This feels like a lot like how Physiogel's lotion feels, so if you like Physiogel's lotion I think you will like this, too. Some people also do feel uncomfortable with the texture of Physiogel, so since this is similar, that's something to ponder upon, too. But to me, it was a lovely experience. And I immediately saw this as something that mom would extremely love because if you've been reading up on a lot of my posts I'm sure you've read of a lot of anecdotes of how sensitive her skin is. She needs gentle products for her skin sensitivity but highly hydrating ones, too, because women her age usually do suffer from skin dryness due to hormonal changes (and then there's age of course).